Darren McFadden returned for the Raiders Thursday night against the Broncos after missing a month because of a high ankle sprain. He carried 11 times for 52 yards and caught two passes for 12 yards and a touchdown in the 26-13 loss to the Broncos. Yet, almost as soon as Raiders fans were able to say hello to him, it looks like goodbye again. The Raiders reported McFadden re-injured his same right ankle, and he was getting treatment for the injury after the game, reported Jerry McDonald of the Bay Area News Group. The Raiders entered this season with high hopes for McFadden, who missed about half of the 2011 season with a foot injury. When he was healthy in 2011, McFadden was brilliant, just as he had been in the 2010 season. 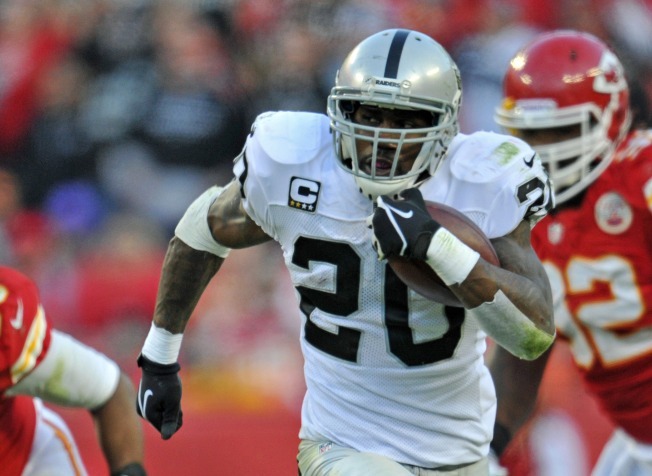 In 2010, McFadden rushed for 1,157 yards and seven TDs and had a 5.2-yards per carry average. The next season he started strong again, rushing for 614 yards until the foot injury ended his season early in Game No. 7. This year, McFadden has played parts of nine games and has 507 yards on the ground. For McFadden, a once-promising career in the NFL has been dogged by a long string of injuries. When he’s healthy, the former first-round pick from Arkansas has shown both power and speed and the ability to be a game-changer. But, the 6-foot-1, 218-pounder also has been brittle, meaning the Raiders haven’t been able to count on him for any length of time. Can the Raiders continue to stick with McFadden? Or should they start searching for an alternative? In his absence this season, the Raiders have found that Marcel Reece, who started the season at fullback, has been both durable and effective. Reece is averaging 4.6 yards per carry (271 yards on 59 carries) and also is a good receiver and blocker. As the 3-10 Raiders now head toward their final three games of the season and what could be a significant offseason of moves after a disastrous first year under new GM Reggie McKenzie and Allen, might the Raiders start to think about going in a different direction, by either trading McFadden, drafting a successor or grooming someone (such as Reece) to share duties with him? Or, are McFadden’s injuries just freakish happenstance, and do the Raiders believe the former Arkansas star can rebound to have the type of performance he did in 2010? On Thursday night, McFadden showed what he can do when he broke off a 36-yard run against a Denver defense that hadn’t allowed a run longer than 24 yards. It was the type of play the Raiders thrived on in the first half of 2011, when they seemed destined to advance to the playoffs. Yet once McFadden was injured in 2011, the Raiders were never the same team. Thursday night, Allen wanted to see what McFadden could do in his return, but because the Broncos jumped off to an early lead and did a good job of controlling the ball, Oakland’s chances were limited. “We wanted to give him an opportunity to get the ball, and we did that,” Allen told McDonald after the game. Now, however, McFadden’s prospects for playing a second straight game, against the Chiefs on Dec. 16, are in doubt.